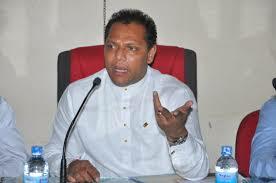 Sports Minister Dayasiri Jayasekara yesterday said he will take a decision to act independently in Parliament, if no action is taken against ministers against whom corruption allegations have been leveled. Safeguarding the persons who have been accused of bribery and corruption was not the intention in the forming of the Yahapalanaya government, he said. “I hope that the President and the Prime Minister will take measures to take action against ministers against whom allegations of bribery and corruption are being leveled,” Jayasekera said. “If not, I will act as an independent SLFP MP in Parliament since I cannot be a part of a government which protect these persons. But I won’t join the Joint Opposition,” he said.